Dust explosions in industrial facilities can be devastating due to the extreme rise in pressure. An innovative system for suppressing and isolating dust explosions is now being used to detect critical rises in pressure to the millibar and react at lightning speed. The highly effective extinguishing agent smothers any flame in an accumulating explosion in a fraction of a second, long before the explosive pressure is unleashed. 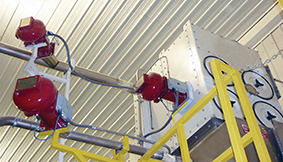 When used for isolation, the IPD system stops the explosion spreading to connected parts of the facility. This provides effective protection to people, machinery and the environment. To make sure the IPD system is ready for use again quickly after being triggered, the designers at BS&B developed a new, modular design. This allows for immediate resetting on site, reducing production downtime to a minimum. Unlike some other solutions on the market, the owner or operator can reset the system independently after triggering. 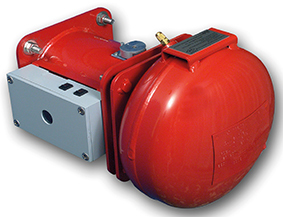 The extinguishing unit consists of an unpressurised, easily replaceable extinguishing agent cartridge and a pressurised container that is filled with nitrogen during installation or reset. The lack of a pyrotechnic trigger means that none of the individual components or the completed system are classified as hazardous goods. This makes both handling and spare parts logistics and management much easier. It also shortens delivery times and reduces cost of ownership, as there is no need to comply with the obligatory safety regulations for transport that apply to conventional systems. Furthermore, the extinguishing unit requires no extra discharge nozzle for the agent. Instead, the integrated rupture disc becomes an aerodynamic outlet when activated. The design avoids the use of plumbing that can become blocked. Alongside the extinguishing unit, the explosion suppression and isolation system features a control unit with touchpad and the innovative Triplex sensor. This ensures constant, real-time monitoring of the process pressure, allowing for fast and reliable activation. Three highly sensitive pressure sensors are arranged in a way that maximises sensitivity while avoiding activation from vibrations. In the event of a power cut, the internal battery continues operation for at least eight hours. This provides enough reaction time to establish a secure energy supply. as a fast heat-absorbing agent. The new IPD system was developed by safety specialist BS&B. It took a product that has been deployed successfully throughout Asia and the Americas for over 20 years and updated it for use according to EN standards. This updated version for Europe has been engineered with ATEX certification. BS&B offers a global network of qualified maintenance technicians, who can help with user training, service and looking after the low-maintenance components.